I had a glorious weekend with family... and I got to spend much needed time with my favorite niece. For this reason though, I'm a little backlogged on blog posting, not to mention homework... but I'll be caught up soon, I hope. I got back into Saint Louis today, and the boyfriend cooked me up an amazing three course meal, including lamb! I'd been thinking about lamb for a while.... it was so yummy, I'm still reeling from it. I made these a while back, but I think they're great for Valentine's Day. 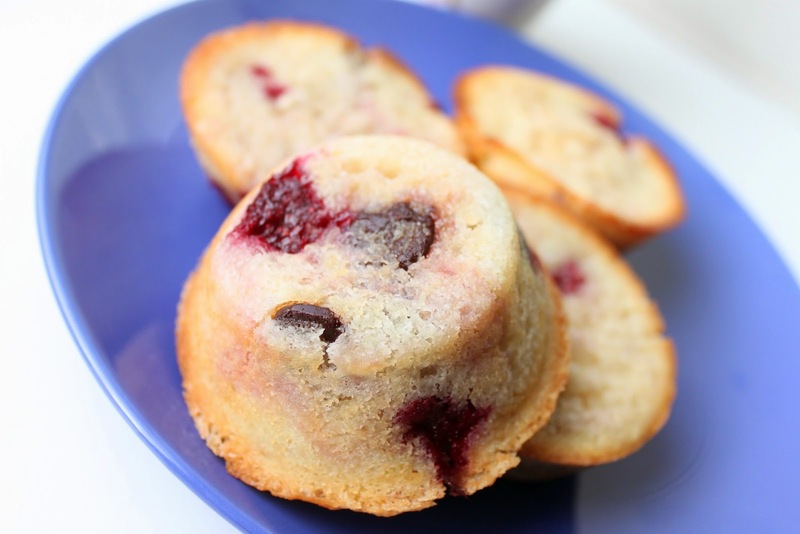 They're delicious soft and buttery muffins (not for anyone who fears butter) with bits of chocolate chips and raspberry pieces baked in. I gave one to Joe when they first came out of the oven and he didn't like them as much as he did after they cooled. His reasoning was that when they were warm, the chocolate was soft just like the raspberry and the textures were too similar. But once it cooled, the hardness of the chocolate chips complemented the softness of the raspberry pieces much better. I have to say, I was more attached to raspberries with white chocolate over dark chocolate but I decided to try this recipe anyway. I was even afraid to taste it, thinking it'd be too weird for me. But I finally did on the second day they were around and concluded... I would love to make this again! Mix all the dry ingredients in a bowl and make a hole/well in the center. Pour in the melted butter, yogurt, water, and eggs, stirring well after each. 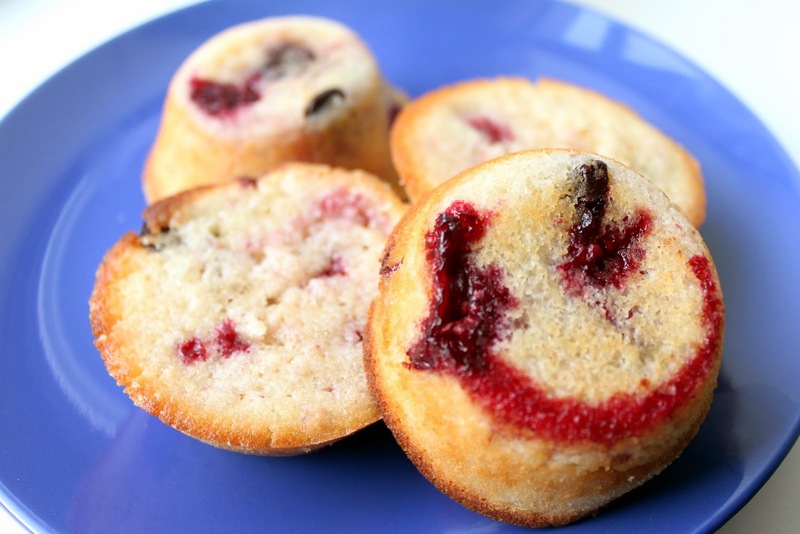 Fold in the raspberries and the chocolate and spoon into muffin pans. Sprinkle the top with the raw sugar. Bake for 30 minutes or so... until the muffins are lightly golden and feel firm and spring back when you touch them. Should keep well if packed tightly and kept in the fridge! Those look divine! Love that combo of flavors!! These are adorable and the perfect size! Delicious looking muffins, nice pictures.